Are you in the Newton area? Education and experience don’t count for much if you don’t present yourself in a professional manner. RelaxSation Massage Therapy & Nails makes sure that every member of our staff always presents the image we want our company to have. Have you been experiencing stiff or aching muscles due to an increase in stress? Do you feel overly tired and have low energy? RelaxSation Massage Therapy & Nails has a solution to help you relax and re-energize. Our certified Massage Therapists will provide professional services guaranteed to supply immediate relief for you, while increasing your physical and emotional Health & Well-Being! It seems like only yesterday that we opened our door at RelaxSation, yet we’re now marking our 6th anniversary. The old saying that “time flies” feels especially apt to us! 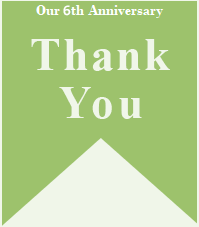 Without you--our valued clients--your support, and your friendship, none of this would have been possible. No words can possibly convey how deeply we appreciate you. Throughout the last 6 years, we have strived to bring you the very best in premium therapeutic massage and nail services and to listen carefully to all of your feedback. In the past year, we have expanded our services to include waxing, all of which reflects our unflagging commitment to provide you the highest-quality service possible. As always, we want to be your first choice in Boston for spa pampering and stellar service. We’re committed to making sure that each and every client’s experience meets the highest standards. We’re all about teamwork. Our staff –every one of them experienced and licensed – have a shared purpose: our clients’ complete satisfaction with our therapeutic massage, nail, waxing, and facial services. We’re up to date with all the newest techniques and practices in massage therapy, as well as using the highest-quality polishes, gels, and tools for our nail clients. Above all, our passion for our clients’ satisfaction remains the cornerstone of everything we do at RelaxSation. Every day, our therapists, technicians, and managerial staff diligently endeavor to earn and retain your loyalty. Our goal is for you to enjoy coming to RelaxSation every bit as much as we love working here for you. One of the most gratifying aspects of the business is the wide and memorable range of clients we continue to meet. They stroll in here from Downtown financial, legal, and medical offices. College faculty and students alike visit, and we’ve had the pleasure and privilege to cater to guests and travelers from the Hyatt, the Omni Parker House, Club Quarters, the Intercontinental, and other top hotels. We’ve earned the loyalty and friendship of television anchors and reporters, as well as residents of the Millenium, the Ritz Carlton, the Province House, the Radian, and other Downtown Boston buildings. We’re so grateful to the many clients who have discovered us as walk-ins or through word of mouth. It’s fun to meet and serve the many singers, dancers, and musicians from touring Broadway musicals. Hosting companies' events, birthday celebrations, corporate promotions, anniversaries, college reunions, and pre-wedding parties has been gratifying for our team. We’ve also worked with medical, legal, and business conferences to provide our services to professionals attending these events in Boston. It is not hyperbole to state what an honor it is to meet all of our clients. It is also an honor to give back to the community, which is why the RelaxSation team regularly volunteers at the Boston Rescue Mission for the Homeless. Six years since our start, we steadfastly profess that regardless of how well we’ve done to earn and retain your trust and your loyalty, we’re always exploring ways to improve. To that end, we prize any suggestions you, our clients. Your advice and suggestions are always key in our determination to make RelaxSation your first choice among Boston spas. As we mark our 6th anniversary, our commitment to you is non-negotiable. Thank you for choosing RelaxSation. Here’s to the next 6 years! All the Massage Therapists employed at RelaxSation Massage Therapy & Nails are licensed and certified by the State of Massachusetts, LMT, and the Nail Technicians that are employed there, are also licensed and certified by The State of Massachusetts. All employees working at RelaxSation Massage Therapy & Nails are experienced professionals, and they all have gone through a Cori Background Criminal check. RelaxSation Massage Therapy & Nails has legal counsel on retainer which protects them against frivolous lawsuits. All information provided is provided for information purposes only and does not constitute a legal contract between RelaxSation Massage Therapy & Nails and any person or entity unless otherwise specified. Information is subject to change without prior notice. Although every reasonable effort is made to present current and accurate information, LinkNow!™ Media makes no guarantees of any kind.